After a big day yesterday, we had a well deserved sleep in. We left my mum at the hotel today as she wasn't feeling up to it and the rest of us ended up leaving the hotel at around 11:00 AM to go to the Studio Ghibli museum! The museum is a little bit further away than the other attractions and is one of the only places that we got recommended to take a train and a bus to. The train part of the trip was pretty easy, but then trying to find the right bus was a little harder, but we did it eventually. The buses aren't as easy as trains for foreigners. The bus took us the rest of the way, but in hindsight we probably didn't need the bus, the walk wasn't that long. Unfortunately I wasn't allowed to take photos inside the museum, but I was outside. It's a real shame too because the building is very cool inside! As we walked up the path to the building, an assistant checked for our reservation that Robert had organised back in Australia (through JTB I think) and directed us to the service desk. From there another assistant issued us with our admission tickets, which were pretty cool, they were little movie strips and each of us got a clip from a different movie. 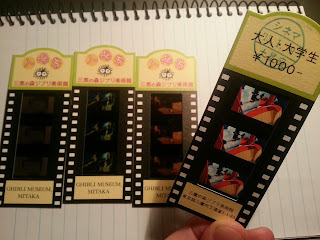 These tickets also got us into the theatre inside the museum to watch a short Studio Ghibli film. They stamped the tickets when you go in to make sure people only go in once. As you enter the front door to the museum, you instantly look up and you can see the three floors of the museum. On the right, there is a antique looking elevator with a steam punk looking gauge to indicate which floor the lift is at. Straight ahead there is a 'normal' staircase up to the next floor. Directly above the entrance, on the second floor there is a small bridge from one side of the floor to the other. To the left there is a small spiral staircase that was a bit of a tight squeeze. The entrance to this staircase was small enough that you had to duck to get in and tall people would have to stay hunched to climb up it. At the top there is a small landing that leads into the wall, where you have to duck to get through there too. 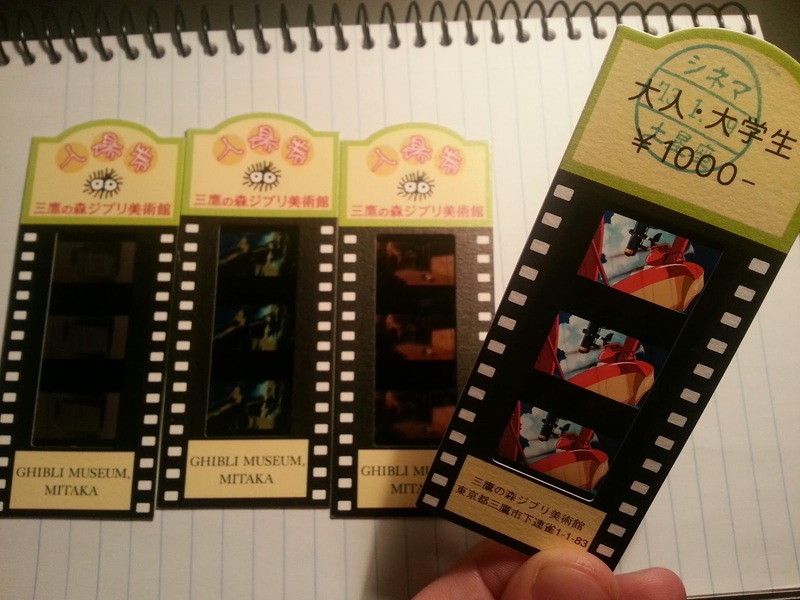 It's obviously designed for kids, but there were a lot of adult Studio Ghibli fans going through too. The museum is like a huge playground for kids! ...and certain adults. The main attractions on ground floor were the theatre and another small room where they showcased some animation models and techniques. Some where quite simple, like a spinning wheel where if you concentrate on one part of it, the character will appear to animated. There were some more advanced ones too, one of them was a large spinning platform with what looked like a series of clay models attached to it (on the floor of the platform and attached to a centre axle above the floor), then periodically it would start spinning, the lights would dim out and a strobe light would flash, which resulted in a large 3D animation that looked really effective! They also had some projection machines setup with a reel of film running through so we could the inner workings. We climbed the spiral staircase and ended up on the third floor. There was a "cat bus" from the movie "My Neighbor Totoro". This area is definitely for kids only and had some assistants to watch over the kids climbing around the bus and stop people like Rob F from getting in. This floor also had a book shop and a small outdoor area. The book shop was pretty busy, there was quite a few books on display for visitors to read through. Most of them were in Japanese, but a lot of them had a focus on the art style used and were mostly images. Both Rob's ended up buying "The Art of Porco Rosso" book. This floor also had access to the roof where there was a large model robot and a cube from the movie "Castle in the Sky" amongst some gardens. With the amount of greenery up there it's easy to forget you're actually on a roof! On the second floor there were a couple of rooms, one that showed a series of the sketches and another that had posters and books - this room was set in an old library and was guarded by a dragon. There were more stairs on the outside of the building and an outdoor food court. There was also a gift shop which seemed to be constantly busy! That's probably the best I can describe it without photos (and I have a pretty bad memory), but it is well worth a visit, especially if you're a Studio Ghibli fan! There are lots of little things that fans will notice, like particular door handles, stained glass, badges on the gates, the drinking fountains outside and bunch of small details that look like they come straight from one of the films! After watching the short film and spending some time in the gift shop we left the museum and followed Google maps through some back streets and made our way back to the station. We headed towards Asakusa to check out the new Tokyo SkyTree. Last time we went to Tokyo, the main observation tower was Tokyo Tower, but since then the Tokyo SkyTree has been constructed and is now a popular tourist spot. The project was completed on 29 February 2012, with the tower opening to the public on 22 May 2012*. From Asakusa we caught the Tobu SkyTree line (a private train line) to the Tokyo SkyTree. The walk to the entrance includes a few shops (with more inside) and some nice gardens, all with a sort of "tree" theme. We bought our tickets and took the elevator to the first observation deck which sits at a height of 350 meters. When the doors open you're greeted with a nice panoramic view of Tokyo and it makes you realise just how big this city is, especially in comparison to Melbourne! The lights at night looked very nice and makes it easy to see just how far the city spans, but as the windows where angled up, not only is it hard to get a photo without reflections but there are purple lights everywhere that reflect down along the window. I also didn't have a tripod (and don't think they were actually allowed) so the photos don't do the view justice. After spending some time taking in the views, we paid a little extra to go up to the next level. This level sits at a height of 450 meters and has a spiral shaped "tunnel" wrapping around the tower. The view at this height is not really that much different to the previous level, but walking through the tunnel is quite nice and due to the spiral shape, the feeling of going higher with every step is a nice touch. The last stop was the glass floor where you can walk over a glass panel that looks straight down to the base of the tower. From here we went back to the hotel and ended up in Akihabara again. Having Akihabara so close to our hotel is nice, it's quite easy to spend time there and with a spare hour or two, it's quite likely that we'll get to see something interesting! My brother had other plans, but he asked us to keep an eye out for the PC game "Exile" and I wanted to buy a polariser for my new lens to go with my ND filter for extra darkness, so with that shopping list in mind we headed down. We went back to the same place I bought the ND filter and found the filter I was after. I ended up buying the polariser and a mini tripod. I spoke to the same sales assistant, who didn't speak much English, but the one word he did get out was "dangerous". This was because I was mounting quite a large dSLR on a tiny tripod, but with good reason. I brought my large tripod, but with a sore back and a low likelihood that I'd need it for many shots, it wasn't worth carrying it everyday, all day, but the mini tripod I can slip into my bag and I'll barely notice it. This would have come in handy for those times where all I need is some stability to get a long exposure, instead of resting it on my wallet or something and trying to get the angle right! We went into a few other shops and kept an eye out for Rob's game, without much luck. We went to the store Rob found his obscure game and asked the attendant where the PC games where. He casually told us they were on level 3, so we took the lift. When we got there, we realised we where in the wrong place... it was a whole floor of adult PC games... a whole floor! Needless to say we left there (without buying anything) laughing at how normal that is for people there. If that was in Australia, I don't think the sales assistant would have been quite so casual about it. On our way back to the hotel we thought we would try the last shop before leaving Akihabara. I had typed out 'Exile' on my phone in large font, so we walked in and asked the sales assistant where the PC games where (they were normal PC games this time). I showed him the name of the game on my phone and asked if he had it, where he replied back with a confident "No". But then, out of sheer luck, right behind him I spotted it! Out of all the games on the shelf, it was the only one showing the front cover, the rest were just spine out. So I told the guy, and he turned around, saw it and turned back with a sort of embarrassed smile on his face. He had a bit of a laugh and apologised. In the end we didn't end up getting it, but it was a pretty funny story either way. Goes to show you can get anything in Akihabara! We ended up getting some Japanese fast food and heading back to the hotel. The fast food is pretty good here, for about $4 you can get enough food to fill you up!